Colie expects the worst when she's sent to spend the summer with her eccentric aunt Mira while her mother, queen of the television infomercial, tours Europe. Always an outcast-first for being fat and then for being "easy" - Colie has no friends at home and doesn't expect to find any in Colby, North Carolina. But then she lands a job at the Last Chance Cafe and meets fellow waitresses Morgan and Isabel, best friends with a loving yet volatile relationship. Wacky yet wise, Morgan and Isabel help Colie see herself in a new way and realize the potential that has been there all along. 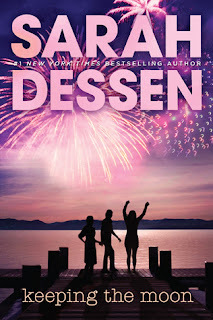 Sarah Dessen will always be my favorite author for contemporaries. Her novels are so simple yet deeper than you would first assume. I always find myself relating to her main characters in some way pretty easily, but for some reason it didn't come too easy with Colie. She used be overweight and was always picked on no matter how often she changed schools, and now that she is skinny (thanks to her fitness guru mom) she can't seem to shake the same feelings she had when she was heavier. She still sees herself as that fat, unattractive girl who no boy would ever want. I loved the story and the coming to know yourself message behind it, but I just couldn't relate to Colie personally. I haven't gone through a big change in my life where I would still keep feelings of being that older self. I could definitely understand her struggle and feel for her, but I just couldn't relate. The characters are all a little wacky to me too. I couldn't see myself with the boy she liked and I couldn't see myself being 15 and friends with 21+ women. This book was a little weird to me and I kept finding myself looking at my little sister, giving her a look, and then criticizing the book while laughing. I think it has to do with the fact that it was publishing in 1999 so it was a little while ago. I definitely enjoyed the novel, but I just couldn't take it too seriously. It was a nice, light, waste the day reading book. It unfortunately wasn't one of the books where I would carry a piece from it with me the rest of my life. It didn't have an aftermath effect on me. I will not let this ruin my love for Sarah Dessen, though. It was a nice read, but it just wasn't a wow factor to me. I liked the story and overall message behind it, but I just couldn't personally relate to it. I did like it and enjoyed reading it, but it just wasn't amazing. I chalk it up to being published in 1999, but who knows. I will definitely not let this effect my love for Sarah Dessen novels, though. I recommend this to fans of YA contemporary, and to those who like a nice light read with a sweet message behind it. i can just see you looking over the book at your little sister. Contemporary is not my favorite genre and i have only tried one YA. It is hard when you cannot relate to the main character and her love interest. Great review! Thank you and haha I know. I just kept staring at her like "are you serious?"